Of all the fishing techniques, fly fishing is arguably the most elegant and artful. It’s why pictures of fly fishermen end up as the subjects of oil paintings and Brad Pitt movie posters. No one is making a cinematic drama about a guy jigging for crawdads. But fly fishing isn’t just nice to watch, it’s also one of the most effective fishing techniques. It gives the experienced angler pinpoint accuracy while simultaneously presenting the inexperienced fish with a very realistic bit of bait. Those benefits do come at the price of practice, however. Getting your casting technique to be smooth and purposeful will probably take hours of awkward rod waving, but it’s a skill that’s well worth the effort. If you’re just getting started and don’t have the convenience of a burbling creek in your backyard, take your setup to a large grassy field to hone your casting skills. You can even set up targets to work on your accuracy. 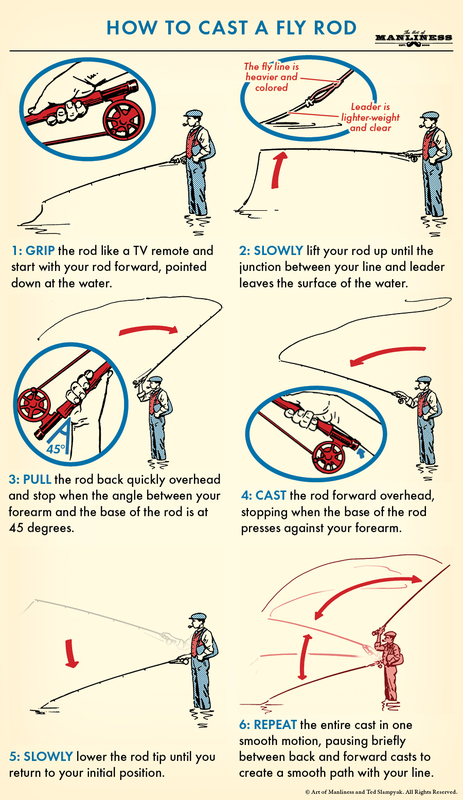 While there are dozens of casting techniques, a basic forward cast will get you well on your way to landing your first trout.